Normal life was disrupted across several states as upper caste groups held a nationwide protest – a Bharat Bandh – on Thursday, September 6, demanding rollback of an amendment bill passed by Parliament that restores the provisions of the Scheduled Castes and Scheduled Tribes (Prevention of Atrocities) Act that overrode a Supreme Court order diluting it. The amendment has now been challenged in the Supreme Court. 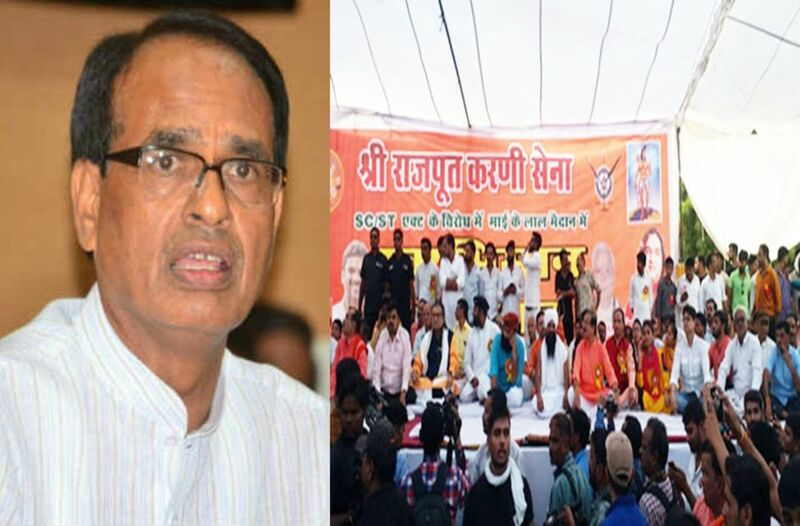 In BJP-ruled Madhya Pradesh, some of the upper-caste protesters have also been targeting elected representatives and raising slogans against the ruling BJP-led government at Centre for voting in favour of the amendment, said media reports. Over the past few days, the state has witnessed protests in districts like Morena, Bhind, Gwalior, Mandsaur and Neemuch, with people from upper-caste— and at many places people belonging to Other Backward Classes — joining hands to gherao legislators, demanding that reservation be rolled back and the checks introduced by the apex court be re-introduced. The response to the protest call seemed spontaneous in as much as there was no single group behind it. Prohibitory orders were in place and tight security arrangements were made to prevent any untoward incident. Schools and petrol pumps were shut across districts and internet services are likely to be affected, said reports. The upper caste anger followed Centre’s move, following protests by SC/ST groups, to get the SC/ST (Prevention of Atrocities) Amendment Bill, 2018, passed in the Lok Sabha, which overturned the Supreme Court’s 20 March order in which it had observed that the Act was being used to “blackmail innocent citizens”. The court introduced safeguards which, SC/ST leaders and organisations said, diluted the Act and rendered it toothless. On 2 April, nine people were killed and many were injured in clashes reported from several places during a Bharat bandh called by SC/ST groups in protest against the controversial Supreme Court order. The amendment to law to overturn the apex court order had its own repercussions – nottoo unexpectedly, given a sustained social media and WhatsApp campaign against reservations and SC/ST groups over the last couple of years. The upper castes want the government to roll back their amendment to the SC/ST Act and restore the “progressive and just” Supreme Court guidelines. They claim upper castes were being oppressed in the name of social justice and many of them have been implicated in false cases – a kind of ‘reverse caste oppression’. Sentiments of most members and supporters of BJP are with the upper castes. MP Chief Minister Shivraj Singh Chouhan’s son Kartikeyreportedly came out in support of the Bharat Bandh and closed shops. Officially, the BJP, however, remains opposed to upper caste stand even as the resentment erupted on Bharat bandh day. Demonstrators took to streets, burning tyres and effigies and stopping trains, forcing locals to stay indoors. Reports of violence emerged from parts of Madhya Pradesh, Bihar and Uttar Pradesh, said a Zee news report. Bandh was also observed in Rajasthan, Jharkhand and Maharashtra. Police lathicharge on protestors was reported from a few places in MP.Protests were held by students and teacher community in Banaras Hindu University. The call for ‘Bharat Bandh’ given by several groups against the amendments in the SC/ST Act evoked a good response in Rajasthan where many shops and business establishments, schools and other educational institutions remained closed. In Jharkhand, demonstrators stopped public transport, and vandalised property, said reports quoting locals. In Patna, Bihar, hundreds of protesters took to streets, some gathering in front of state BJP office. The BJP, caught in a bind due to protests from its core constituency, is cautious. UP CM Yogi Adityanath said that the Bharat Bandh called by some upper caste and OBC groups in the country in protest against the parliament amendment over SC/ST Act has “no meaning”. “It (Bharat Bandh call) has no meaning. People have their feelings. In a democracy everyone has the right to express themselves,” Uttar Pradesh Chief Minister Yogi Adityanath told news agency PTI. Defending the provisions of the Act, Adityanath said his government will ensure that the law is not misused. “The BJP government is committed towards the welfare of people and development. We never play politics of caste and religion. The law is to protect the downtrodden. The government will ensure that it will not be misused,” he told mediapersons in Gonda where he had gone to visit flood-hit areas.